The requirements analysis phase answers the question, “What does the user need and want from a new system?” The requirements analysis phase is critical to the success of any new information system! In this milestone we need to identify what information systems requirements need to be defined from the system users’ perspectives and draw graphical, logical models to document the data requirements for a new and improved system. 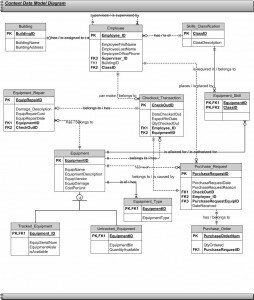 Data modeling is a technique for organizing and documenting a system’s data. Data modeling is sometimes called database modeling because a data model is usually implemented as a database. Data is viewed as a resource to be shared by as many processes as possible. As a result, data must be organized in a way that is flexible and adaptable to unanticipated business requirements – and that is the purpose of data modeling. In this milestone, you will first discover those entities in the system that are or might be described by data. Then you will define each entity you identify in respect to the business in an Entity Definition Matrix. Then you will do the data model tutorial in doc sharing that will prepare you for doing the logical entity relational diagram (ERD). • Understand and perform the techniques for entity discovery. data requirements for the proposed system. • Construct the Context data model (Logical ERD). 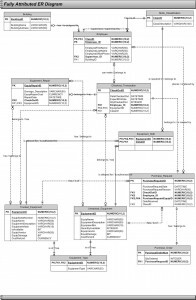 • Data modeling — Chapters 8 and 14. Now that we have studied the current system and analyzed some of its problems and opportunities, plus gained approval to proceed, we can now start to identify the business data requirements and graphically model them. In this assignment, we will use our results of the previous milestones, samples of forms we have collected, and a copy of a transcript of an interview with Dan Stantz’s staff. The results of this activity will identify the business data requirements for the proposed system. 1. Complete an Entity Definition Matrix. Analyze each of the forms referenced by the user interview and make assumptions where necessary. (Note: While it is appropriate to make assumptions, you should document those assumptions and include them in your submission to your instructor.) If you create the matrix in Excel, paste it into a Word document prior to submission. Relationship Diagram (ERD), located in Doc Sharing. of the Word document that already holds your Entity Definition Matrix. 3. Prepare a Context Data Model. Deliverable format and software to be used are according to your instructor’s specifications. Deliverables should be neatly packaged in a binder, separated with a tab divider labeled “Milestone 4-Part I”. For the advanced option, assume that the proposed system must also handle the tracking accounts receivable and payments on customer statements. Your instructor will specify additional system requirements for this part of the system. Modify your initial Entity Definition Matrix to be able to handle this system requirement. The following is a copy of the transcript of an interview between you and Oscar Barrett. The goal of this interview was to obtain sample forms used for processing check-ins and check-outs and to be able to ask questions about them in order to discover data entities of the business system. Scene: You have arranged to drop by the Equipment Depot to pick up samples of forms used to process check-ins and check-outs. Oscar Barrett was willing to collect them and answer any questions that you might have. Oscar: Hi. I assume you are here to pick up the forms. You: Yes. Is this a good time? Oscar: Sure. Here are the forms. Any questions? that mean that equipment is still out? record all the check-ins and check-outs an employee did in the morning. If that employee returned in the afternoon to return equipment, we would use a new form. as possible. So it is easier to simply fill out a new one for each visit. You:	But if the new system made it easier to find those records and update them? Oscar: Yeah, that might make the whole system work better. You: OK. What is this “employee ID”? Does the Maintenance Department assign that? wallets and look up their ID. We can just read it. You: Do you have to record both the “equip ID” and the “description”? we want to specifically track and know who has it. small for an equipment ID and some are too inexpensive to be worth tracking. 123456789, is stamped on the side. That is an expensive item. We want to track it. We want to know that John Doe has checked out that particular air compressor. We want to know where that particular air compressor is at all times. You: OK. And you call that tracked equipment? Oscar: Right. That nailer on the second line is tracked. You: So what is the “equip id” on the router and bits? have the same ID. 1425 means a router and bit set. you know its number for the form? time. But those numbers are also printed on each bin. front of the bin is a card that says Equip ID 1425. You:	Is the tracked equipment also stored in bins? Oscar: No. Most of them are too large to fit in bins. They are stored in a particular aisle. You: And you keep all this storage information in your head? Oscar:	We know where all the most popular equipment is stored. But for uncommon requests we refer to this storage list. (see Exhibit 4.3) It shows the aisle or bin location of each kind of equipment. This is just part of it. You can have that. You: Does some information system generate this list? Oscar: Just a word processor. You: What is this “type” column? Oscar: We categorize the equipment –carpentry, welding, plumbing, machine tools, etc. We have so machine pieces of equipment that those type codes really help us when we’re searching for a particular piece. You: OK. One more time, let me make sure I understand tracked versus untracked. On this check-out form you know that this employee checked out a router and bit set. But you don’t know which router and bit set. Oscar: Right. We know which nailer but not which router. Here’s another example and this might clear things up for you. Let’s say that an employee wants checks out a wrench. A wrench is relatively inexpensive. Also, it is virtually impossible to track. A particular wrench does not have a serial number on it! But since it is relatively inexpensive and virtually impossible to track, we don’t even attempt to do so. We simply want to keep track of the fact that the employee checked out a wrench. We don’t care which wrench. We only care that we get the wrench back. You:	OK. Two kinds of equipment and slightly different information kept for each. But everything has an Equip ID. untracked we could have several. You: Do you need the system to track the quantity you have of each kind of equipment? nice if the computer had a total and could subtract the outstanding loans. Sometimes I’ve suspected people of sneaking in here and raiding our inventory. inventory online before they trudge over here. possibly be more than one. You:	Is “damage” recorded for check-ins or for check-outs or for both? looks like as long as it works. understandable. I see you track supervisor. Oscar: Right. If someone isn’t returning something we go to the supervisor. You: Are supervisors also employees? You: And the supervisor of the maintenance managers is Mr. Venkman. equipment and restrict check-outs to employees having that class. by employees with any of several skill classifications. for the purchases, do we? into XML that we can use to update our own internal database. problem, I’m all for it. You: Well, believe it or not, that’s all my questions for now. Thanks for your time. Oscar: Anytime. I’m excited about this new system. This week you are building on the previous week’s activity. Please make sure to review the Milestone 4, Part I Solution (located in Doc Sharing) before continuing with the Milestone 4, Part II activity. The synopsis below is the same as the synopsis for Week 4. It is shown below for your convenience. In this milestone, you will first discover those entities in the system that are or might be described by data. Then you will define each entity you identify in respect to the business in an Entity Definition Matrix. Then you will do the data model tutorial in doc sharing that will prepare you for doing the Fully-Attributed data model (Physical ERD) for ECS. • Construct the Fully Attributed data model. 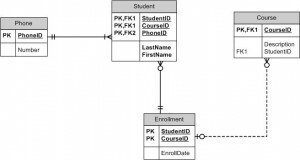 • Data modeling – Chapters 8 and 14. 1. Create a Physical ERD (Fully-Attributed data model) for the ECS case. Deliverable format and software to be used are according to your instructor’s specifications. Deliverables should be neatly packaged in a binder, separated with a tab divider labeled “Milestone 4-Part II”. Below are the attributes for all the tables to the Milestone 4, Part I Solution. Your job is to identify which attributes belong to which entities. Remember that you must specify in your tables when creating them, each entity’s primary key. When you link two tables, Visio will create the foreign key automatically for you in the child table. Be sure to review the Fully-Attributed ERD tutorial before you begin. Remember that foreign keys go always in the child table (crows feet side).